In this excerpt, Augustin Calmet, author of The Phantom World (2012), recalls the chilling story of blood-sucking vampires in 18th Century Hungary. About fifteen years ago, a soldier who was billeted at the house of a Haidamaque peasant, on the frontiers of Hungary, as he was one day sitting at table near his host, the master of the house saw a person he did not know come in and sit down to table also with them. The master of the house was strangely frightened at this, as were the rest of the company. The soldier knew not what to think of it, being ignorant of the matter in question. But the master of the house being dead the very next day, the soldier inquired what it meant. They told him that it was the body of the father of his host, who had been dead and buried for ten years, which had thus come to sit down next to him, and had announced and caused his death. The soldier informed the regiment of it in the first place, and the regiment gave notice of it to the general officers, who commissioned the Count de Cabreras, captain of the regiment of Alandetti infantry, to make information concerning this circumstance. Having gone to the place, with some other officers, a surgeon and an auditor, they heard the depositions of all the people belonging to the house, who attested unanimously that the ghost was the father of the master of the house, and that all the soldier had said and reported was the exact truth, which was confirmed by all the inhabitants of the village. In consequence of this, the corpse of this spectre was exhumed, and found to be like that of a man who has just expired, and his blood like that of a living man. The Count de Cabreras had his head cut off, and caused him to be laid again in his tomb. He also took information concerning other similar ghosts; amongst others of a man dead more than thirty years, who had come back three times to his house at meal-time. The first time he had sucked the blood from the neck of his own brother, the second time from one of his sons, and the third from one of the servants in the house; and all three died of it instantly and on the spot. Upon this deposition the commissary had this man taken out of his grave, and finding that, like the first, his blood was in a fluid state, like that of a living person, he ordered them to run a large nail into his temple, and then to lay him again in the grave. He caused a third to be burnt, who had been buried more than sixteen years and had sucked the blood and caused the death of two of his sons. The commissary having made his report to the general officers, was deputed to the court of the emperor, who commanded that some officers, both war and justice, some physicians and surgeons, and some learned men, should be sent to examine the causes of these extraordinary events. The person who related these particulars to us had heard them from the Count de Cabreras, at Fribourg in Brigau, in 1730. 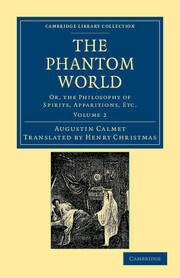 Excerpt from Chapter VIII of The Phantom World, Or the Philosophy of Spirits, Apparitions, Etc (re-published 2012) by Augustin Calmet and edited by Henry Christmas.